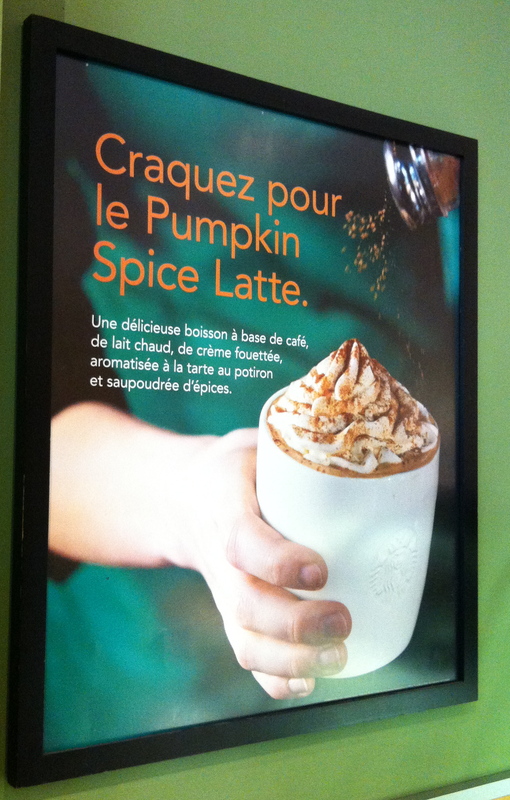 Alrighty then … no more pumpkin pies for the Frenchies. 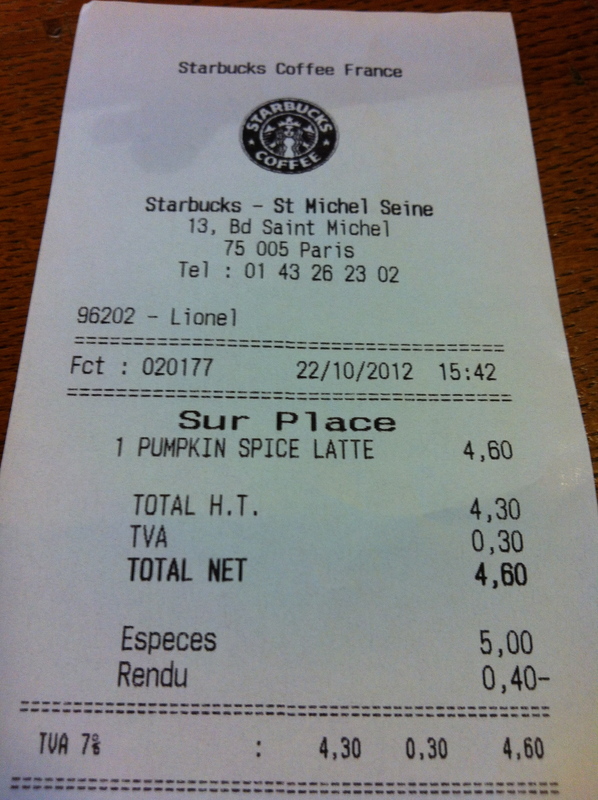 So, you can imagine my surprise last week when I happened across a photo of a Pumpkin Spice Latte posted on the Facebook Wall of an American friend living here in Paris. 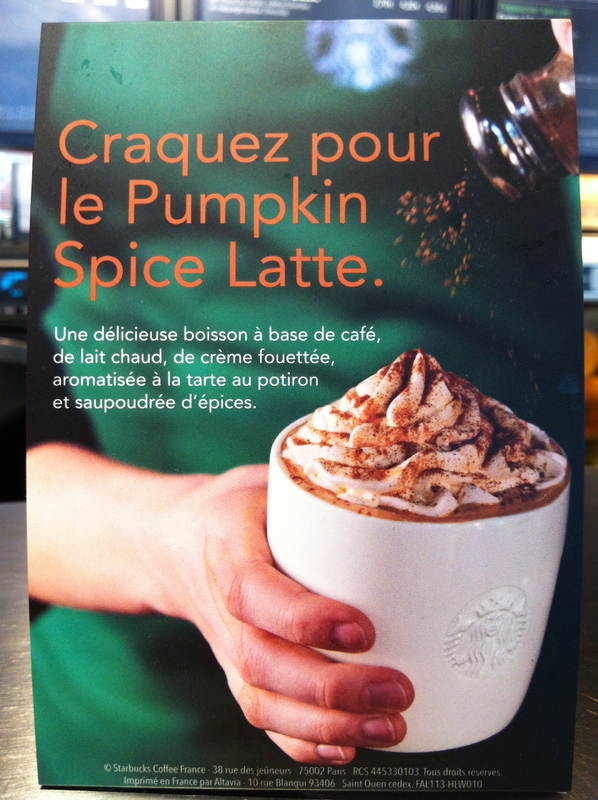 “Wait, wait … there is pumpkin spice at Starbucks in France now? Oh happy day!” I exclaimed (in a virtual way). It seemed that Starbucks was about to make my self-imposed exile just a bit sweeter … and with notes of Thanksgiving spices! Oh joy! “What? You’re kidding, right?” I half-pleaded. A man on a mission, I hopped on the Métro and off I went. Arriving at the next location, I snapped the photographic evidence of that visit and placed my order. As if in some Seinfeld sketch, I found myself standing there in utter dejection as the cashier/drink caller apologetically informed me that they, too, were completely out of Pumpkin Spice! Indeed. Guess I was completely wrong about the French and pumpkins after all. Not to be deterred, I headed on to the next location on the list: “Starbucks Saint Michel Seine” — just up the road a bit. I got in line, wondering how comic this was going to get, and forgot to take the requisite photo. What can I say? I was a bit frazzled by this point. “Hello. Do you still have Pumpkin Spice?” I inquired hopefully. “Oh, GOOD! I’m SO happy! You are the THIRD Starbucks I’ve been to this afternoon looking for it! They’re out of it EVERYWHERE!” I exclaimed. I probably sounded like someone starting a Depression-era bank run, and I probably looked like a junkie desperate for a fix … what with the beads of sweat popping out on my forehead from running all over town and my evident state of overexcitement. When I finally sat down with my Pumpkin Spice Latte (to which I had added extra cinnamon and nutmeg, ’cause I’m spicy like that), I was truly content. I savored the first sip, and although the temp was bordering on tepid, the flavors were just right. Alright, so it never looks as good as the ads. So, what had threatened to become a wild goose chase all over Paris ended up being a successful outing. Plus, it’s nice to know now that when I get a craving for a taste of America in my coffee, I can just stop by a Starbucks … or two … or three. Now I’m just wondering if the Eggnog Latte is going to make an appearance in December. Stay tuned to see how many Starbucks I have to hit the week before Christmas before I can find one of those in this town! P.S. 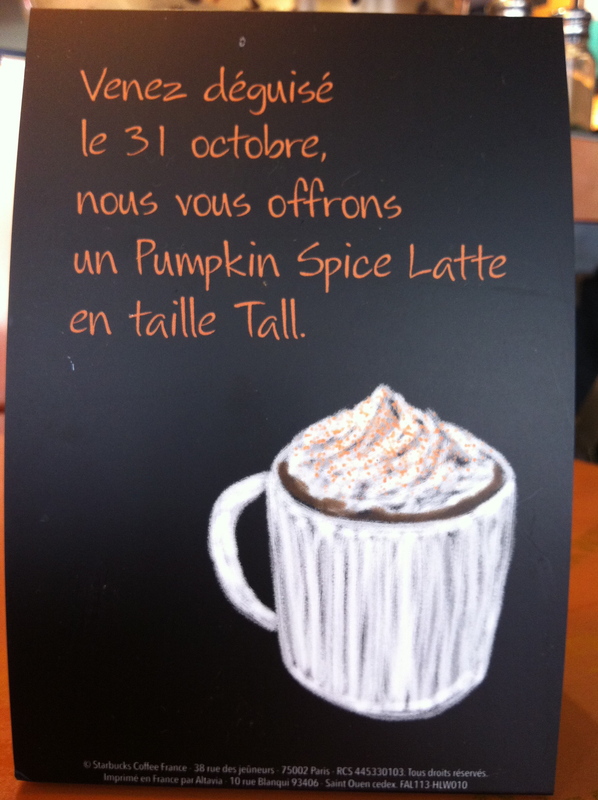 — If you come into a Paris Starbucks in costume on Halloween, you’ll get a free tall Pumpkin Spice Latte. Is it worth saving $6? Let me know what you think! Wait, so they have fresh cranberries at Thanksgiving? That’s funny, I read online recently that there is a shortage of them in the US too (something about a manufacturing/distribution problem). I read about that too! I think I saw something on Huffington Post about it a few weeks ago. NO WAY!!! I am so excited if I can finally get a pumpkin spice latte here. I just accepted not having one as a sad truth of living in Paris! Now there is hope 🙂 thanks for the post! Tout à fait ! But you might have to run around a bit to find it. I was back in Starbucks #2 today and they were STILL out of it! Ouch, the price. It would be worth it, though, just for one. Have not had one in YEARS. Going to Bordeaux on Thursday, and will check out the Starbucks there. Thanks for the fieldwork! Hi! I hope you don’t mind but I have a small question. 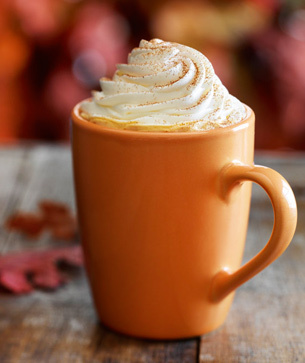 I’ve just arrived in France, it’s my first autumn season and so I was wondering, since it’s so late into the season, do you think they’re still selling Pumpkin Spice Latte at Starbucks? That’s a good question. I’m not sure to be honest, because I haven’t been in in a while. One thing you’ll notice quickly about Starbucks is that they’re close enough to the US version to feel comfortable, but different enough to reflect local tastes. Some of the Christmas season drinks, for example, are a little different. For one, you won’t find eggnog lattes here. (Which, for me, was a sad discovery.) 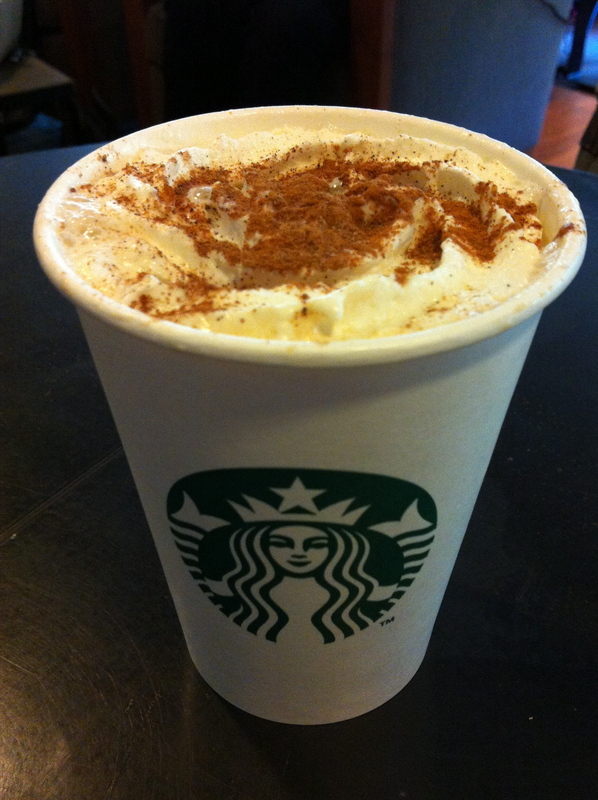 Let us know if you do end up finding a pumpkin spice latte this late in the season!